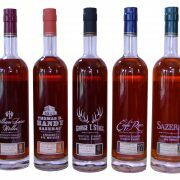 The story: This eighth release in Heaven Hill’s annual Parker’s Heritage Collection series is the first that is not a bourbon. (Purists may argue that the 2011 release, which was finished in cognac barrels, was not a bourbon either, but I will allow it.) The straight wheat whiskey (meaning the mash bill must contain a minimum of 51 percent wheat) was barreled in the first run of what would become Bernheim Original Straight Wheat Whiskey, hence the name “Original Batch.” While Bernheim is aged for seven years, this whiskey stayed in wood for 13. It is also bottled at barrel strength. Both factors should give it more depth than Bernheim, which is cut to 90 proof. Heaven Hill kindly provided The Bourbon Babe with a sample of Original Batch; let’s taste it and see. The nose: Very aromatic – so much so that I could easily detect it above the glass. Sweet, like baked goods – a scone or buttered biscuit, perhaps; just a bit of char and new leather. 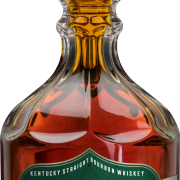 The taste: The most distinctive quality of Bernheim is its emphasis on the mid-palate, and the Original Batch only increases that, more than just about any whiskey I’ve tasted. A soft, sweet entry absolutely envelopes the middle of the tongue with rich flavors of butterscotch and toffee. 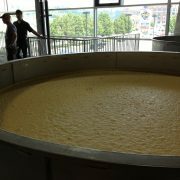 And where the Bernheim has a very light mouth feel, the Original Batch is thicker and more substantial, almost syrupy. That higher proof also brings more heat and spice and a longer, richer finish. The verdict: If you like Bernheim (or are partial to wheated bourbons), you will love Original Batch. It amplifies all the best qualities of Bernheim for a bolder, richer, chewier whiskey that will leave you with a warm feeling long after you’ve drained the last drop.